필라델피아, 미국의 더 필라델피아 하우스 | 호스텔월드에서 예약하세요. You may cancel with no charge on our part anytime time EARLIER than 30 days prior to arrival. Be aware that the deposit charged by Hostelworld is *not* charged by us and you will need to contact them about the deposit. Within 30 days, the reservation is non-refundable. If you are a resident of the city or zip codes within a 10 mile radius, you MUST provide proof of ongoing travel, as this is a travelers hostel. Otherwise, you are not permitted to stay. A valid international passport or US government-issued ID (such as a US state drivers license) is required to check in to the hostel for your stay. Due to the close communal quarters share by our guests and our staff, we need to consider the safety and needs of the many. In doing so Management reserves the right to deny stay/use of the facilities to anyone for the following reasons but is not withheld to the reasons listed. These reasons are up to the manager’s discretion and may include Overall Health, Cleanliness and Mental State. By checking in the guest understands that this is NOT A LEASE and their stay is TEMPORARY ONLY. This is not accommodations for long term. As such, the guest understands and agrees that they have no legal tenant rights as prescribed by law; rather they are held to the short term housing and hoteliers law and statutes. By checking in, the guest agrees to abide by all rules set forth herein, as well as follow the legal direction of City House Hostels, its subsidiaries, staff, employees, managers, and its agents. Should a guest fail to comply with any of the herein agreed to terms and conditions or cause damage to the property, City House Hostels and its subsidiaries reserves the right to charge the guest and/or request that the guest vacate the property. 1) NO SMOKING INSIDE THE BUILDING, NOR OUT OF THE WINDOWS. GUESTS MAY SMOKE OUTSIDE ON THE SIDEWALK AND NOT BLOCKING THE DOOR. 2) IF YOU USE ANY OF THE DISHES, PLEASE WASH THEM AS SOON AS YOU ARE FINISHED WITH THEM AND PLACE THEM IN THE DRYING RACK SO THAT THEY ARE AVAILABLE FOR OTHER GUESTS TO USE — DO NOT LEAVE THEM IN THE SINK OR ON THE COUNTER. 3) PLEASE DISPOSE OF ANY TRASH THAT YOU BRING INTO/MAKE IN ANY OF THE COMMONS AREAS AND GUEST ROOMS. PLEASE REMOVE YOUR SHOES UPON ENTERING THE PROPERTY (Slippers are OK) — Help us keep the hostel clean and comfortable for everyone! 4) IF YOU LEAVE PERSONAL BELONGINGS OUT IN COMMON AREAS OR BATHROOMS, THEY WILL BE PLACED IN LOST AND FOUND — Please help us keep common areas free of clutter! 5) PLEASE SLEEP IN THE BED ASSIGNED TO YOU – BEDS ARE ASSIGNED AUTOMATICALLY BY THE COMPUTER AND OFTEN TIMES SOMEONE ELSE IS ALREADY ASSIGNED TO THE BED YOU WANT TO TAKE. PLEASE SEE AN R.A. WITH ANY OTHER QUESTIONS REGARDING BED ASSIGNMENTS. 6) NO SLEEPING ON THE SOFAS OR IN ANY OF THE COMMONS AREAS. 7) PLEASE KEEP YOUR TOWELS EITHER ON YOUR BED, HANGING OFF YOUR BED, OR LEAVE THEM IN THE LAUNDRY BASKET AT THE END OF THE HALL. 8) IF YOU WISH TO HAVE A FRIEND VISIT, PLEASE HAVE THEM IN THE COMMON AREAS ONLY, AND NOT IN THE GUEST ROOMS. 9) PLEASE LABEL YOUR FOOD WITH YOUR NAME AND YOUR CHECK-OUT DATE AND STORE IT IN THE KITCHEN. ALL FOOD ITEMS WITHOUT A NAME AND/OR DATE MAY BE DISCARDED. ALL FOOD IS TO BE EATEN IN THE KITCHEN OR LIVING ROOM. PLEASE DO NOT STORE OR EAT FOOD IN GUEST ROOMS SO AS TO NOT DRAW BUGS. 10) NO ILLEGAL DRUGS ON THE PROPERTY. NO ALCOHOL CONSUMPTION BETWEEN THE HOURS OF 10 PM AND 10 AM. 11) QUIET HOURS ARE FROM 10 PM TO 10 AM EACH DAY — Please no drinking or excessive noise during this time so as not to disturb other guests. 12) CHECKOUT IS BY 11 AM. YOU ARE MORE THAN WELCOME TO LEAVE YOUR LUGGAGE IN OUR LUGGAGE STORAGE AREA WHILE YOU SPEND THE REST OF THE DAY IN THE CITY, BUT IF YOU ARE CHECKING OUT TODAY, YOU MUST BE OUT OF YOUR BED BY 11 AM AND STRIP YOUR BED OF THE DUVET COVER, PILLOW CASE, FITTED SHEET, AND TOWEL AND PLACE THEM IN THE LAUNDRY BASKET AT THE END OF THE HALL SO ROOMS CAN BE CLEANED AND BEDS CAN BE RE-MADE IN A TIMELY FASHION FOR THE NEXT ARRIVING GUESTS. 14) Items turned in to Lost and Found will be discarded every seven days. If you think you’ve lost something, please contact us within this time frame. IF YOU FAIL TO ABIDE BY THE RULES YOU ARE AGREEING TO, OR IF YOU CAUSE DAMAGE TO THE PROPERTY OR DISTURB OTHER GUESTS OR STAFF MEMBERS/MANAGERS, YOU MAY BE ASKED TO LEAVE THE PROPERTY OR YOUR CREDIT CARD ON FILE MAY BE CHARGED ACCORDINGLY. If your bed sheets, linens, and towels are not returned, your credit card on file will be charged for any missing items. No one under the age of 18 allowed without prior written approval of Property Manager. Any disturbances caused by a guest to other guests, staff, or the property itself may result in the guest being asked to leave the property. Each guest is required to clean up after themselves and keeping tidy, including but not limited to their bedding, clothing and personal belongings in the bedroom and common areas, keeping clean of dishes and utensils that the guest uses, and anything else that is left in any common area. All common areas are secured with CCTV digital recording cameras. By checking in to the property, you acknowledge that recording is in progress. While every attempt is made to provide a safe and secure housing solution, City House Hostels and its subsidiaries, its management, staff, and associates take no responsibility for any personal belongings; the guest is responsible for the security of all their personal belongings. Guest understands that City House Hostels and its subsidiaries, its staff and management are not responsible in any way for any injuries caused while guest is on the property. Guest assumes all risk and any subsequent responsibility to their well being while at City House Hostels and its subsidiaries. Furthermore, by agreeing to the Terms & Conditions Guest agrees to waive all perceived or actual responsibility against City House Hostels and its subsidiaries its staff, and management for any injuries occurred while at City House Hostels and its subsidiaries. Only allowed if you reserve an entire room for your party. This means you could reserve a private room or a larger room, but you must reserve the entire room. At least one member of the party must be 18+ and they will be 100% responsible for any other under age guests. Please contact us before hand. At least one member of the party must be 18+ and they will be 100% responsible for any other under age guests. 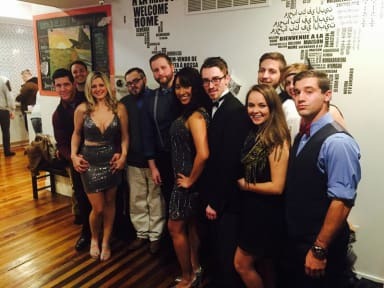 Come as a guest and leave as a friend when you stay at 'City House Hostels: Philadelphia Liberty'. We know first hand that one of the most amazing benefits of traveling is making friends along your journey. We also know, one of the biggest drawbacks is the financial needs to make that travel happen. Which is why we cater to thrifty travelers and seek to accommodate our guests with a budget-oriented stay and friendly atmosphere. With FREE nightly Happy Hour and Events such as Salsa dancing lessons, karaoke or Pub Crawls we guarantee you’ll enjoy your time with us! Located in the heart of America's most historic square mile, Old City, Philadelphia Liberty; our home provides guests a plethora of historical sites, art galleries, restaurants, and bars within walking distance! Also, so close to the metro that you can get anywhere in a moment’s notice. With an active nightlife and cultural opportunities surrounding 'City House Hostels: Philadelphia Liberty' there's something for everyone! At our hostel, we believe that just because you aren't at home, doesn't mean that you can't have a home. Whether you stay for business or pleasure, our location is a convenient, friendly place from which to experience Philly's culture and history. With a downtown historically significant location conveniently situated in a hip mixed use district, 'City House Hostels: Philadelphia Liberty' is surrounded by a plethora of shops, restaurants, amazing historical sites, bars and clubs. Philadelphia buzzes from early morning until late night. Travelers are connected via 4 bus routes on the same block, a metro line just 2 short blocks away. 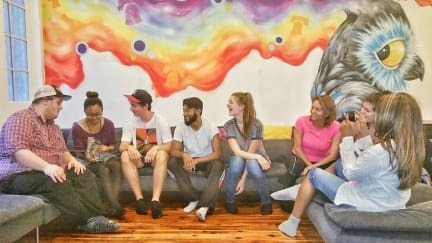 At the City House Hostels: Philadelphia Liberty we aim to provide you with comfortable, affordable, and fun accommodations where you can feel at ease and meet fellow budget travelers in a lively and relaxed environment. We provide a unique backpacker experience which offers great facilities including internet, chill out areas, lockers, tourist information, internet access, movie nights, luggage storage, telephone facilities and more! We are a 'shoes free' hostel to help ensure cleanliness and to provide a 'homey' feeling. Please feel free to bring an extra pair of slippers for indoor use! Things to Note: General: Payment upon arrival in cash or credit card (We accept: Visa, Mastercard.). 18% tax not included. Be prepared to present valid identification. We do not accept local guests. Minimum check in age is 18. Maximum 14 day stay. Flexible checkout. Secure luggage storage. Guests must provide locks to use lockers. No curfew. No use of illegal drugs. No alcohol consumption between 22:00-10:00. I had a great time in hostel. At first I was little afraid but everyone was kind and gentle. If I go philadelphia again, I want to visit here again. While I was one my road trip, I stayed over 5 different hostels. Among them, City house hostel was the best. It is clean and roomy, atmosphere was the best as well. I would highly recommend to my friends. 직원들 좋습니다 매일밤 8시에 공짜맥주를 줍니다. 맥주는 매일 제공되는데 매일 파티처럼 노는건 아닌거 같습니다. 위치 최고입니다. 숙소 근처 돌아다니기만 해도 구경하는 재미가 있습니다. 남녀 혼숙에 화장실 사용이 좀 불편하긴합니다. 작은 호스텔이라 손님에 따라 분위기를 좀 많이 탈것같긴 합니다. 처음 미국여행와서 처음 묵는 게스트하우스인데 위치도 나쁘지 않고 분위기는 top이라고 할 수 있습니다. 매일 beer party가 열려 여러 사람들과 얘기를 나눌 수 있는 분위기가 조성되어 있으며 직원들도 매우 친절하다 24시간 카운터에 있으니 도움이 필요할 땐 언제든지 도움을 줍니다. 다만 불편했던 점은 화장실과 샤워실이 층마다 두 개씩 있어서 좋았지만 따뜻한 물이 나오지 않는 부분이 있어 그부분은 불편했다. 하지만 전반적으로 만족했고 가격 대비 정말 분위기 좋은 게스트하우스라고 추천하고 싶다. 스탭분들이 잘 해주셨고 시설도 꽤 괜찮았다. 그런데 문제가 생겼을 때 호스텔의 boss는 일을 제대로 처리하지 않았고 오히려 문제의 책임을 우리에게 뒤집어 씌웠다. 문제가 발생하지 않았으면 boss와 연락할 필요가 없어 좋은 인상만 남았을테지만 실망스럽고 화나는 기억으로 남았다. 신발을 벗고 들어가는 점이 인상적이었다. 나무 바닥이라 걸어다닐 때마다 삐그덕 소리 엄청 들렸다. ㅠㅠ 밤에 사람들 화장실갈때마다 깼음 ㅠㅠㅠ 밤귀 예민하신분들께 비추!!! 위치는 나쁘지 않아요. 바로 근처에 지하철역도 있고 버스정류장도 있어요. 인디펜던스홀,자유의 종,방문자 센터까지 걸어서 가기에 충분한 거리에요. 다만 오래 머물 숙소로는 별로 추천하고 싶지 않아요. 화장실은 층별로 2개씩 있고 화장실과 샤워실이 하나로 붙어있어요. 세면대는 화장실 밖에 방으로 가는 복도에 세개가 있어요. 샤워실 수압이 매우 약하고 청소를 제대로 안하는 것 같아요 물이 잘 안빠젔움.. 청결상태는 전반적으로 깨끗하다는 느낌이 들진 않았어요. 이런거에 민감한 편이라면 추천하고 싶지 않아요! 숙소 전반적인 분위기는 나쁘지 않은편이고 직원들도 친절해요~ 매일 저녁에 맥주파티를 해서 다른 여행자들이랑 대화 나눌 기회도 많아요.